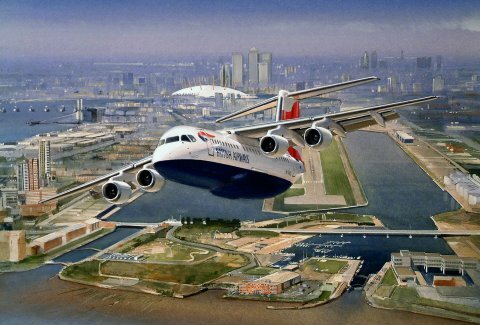 Thank you for visiting our website containing some of the very best fine art prints in airliner and maritime art, each from original paintings of the same name. We have spent many years building up this extensive portfolio. As these are mostly limited editions. Once they are sold out, that is it and the airliner may well never be the subject of a print again. As you will see some editions have already reached this situation. All the prices shown include postage and packing worldwide and our website is set up through pay pal to accept all major debit and credit cards. You can contact us to place an order also. We have a collection of original paintings as well and each title on the drop down menu will tell you if the painting is available for sale. We are eager to expand our range of subjects as there are new fleets that we are yet to publish. With time I hope this will be the case and to this end we would love to hear from you with your thoughts and ideas. You can e mail us at info@sapiart.com. We take great pride in the service that we provide and ensure that the print you receive is of the highest quality. Our art, as with all art, should be about emotion, bringing pleasure to you if you are a collector, enthusiast, flew with or worked on the subject of the print. Please browse through our website and discover the print that you may have always wanted. Below is our latest release named “Ever Changing View” from November 2018. 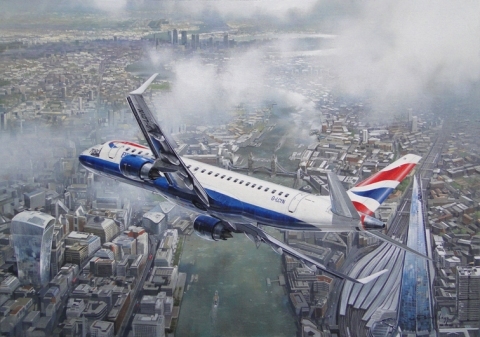 This is an outstanding piece of art by Darryl Legg featuring a BA CityFlyer Embraer 190 over London. New releases for this year will be announced shortly.